Fun With Frisian: NACHT - "night"
Nacht means "night" and is pronounced with an "ah" sound like in "father" and a harsh "ch" sound like in "Bach" or "l'chaim!" --the sound that is rather like a hard "h" said by someone trying to clear their throat. Swart means "black" and supposedly is pronounced more or less how it looks, with an actual "w" sound and rhyming with "art." 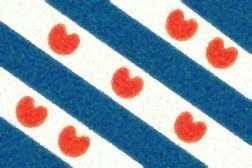 A "w" often becomes more of a "v" in Frisian, but I suppose we'll trust the 100-year-old glossary. Apparently, the sw- combination at the start of a word is the same sound as it is in English. We have already looked at is. It is like its English twin, including ending with a "z" sound. Perhaps the "ih" vowel is a bit shorter than we might sometimes say "is" in English. Really, though, this word is as easy as they come in a foreign language. Aaklik is pronounced AHKluhk with a long version of the "ah" in "father and an "uh" (schwa) in the second syllable. It means "dismal" or "dreary," which is an awfully useful word to have at your disposal in late February. No means "now" and is said like the word "no" or "know". Now you know how to say no. De is another cognate. It means "the" and is pronounced with a schwa. It sounds like "duh," only with a bit of a shorter vowel than the rude little English word. Our translation will be "Black, dreary black, is the night now." Seeing as I'm typing this up well after sunset on a cold February night, this particular sentence certainly has some immediate relevance.